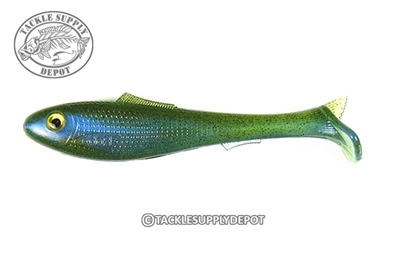 The EZ Shad can be rigged completely weedless on a weighted swimbait hook and tossed around the thickest jungles to pull out giant bass. Specially made with Roboworm's special blend of plastic which creates both great durability and action as well as with a unique double dorsal fin to hide the hook yet not interfere with the hookset. Made with the robotic precision and detailed color patterns that can only be expected in a Roboworm product.